Pioneers in the industry, we offer hid fargo 81754 ultra pvc card, adhesive pvc card, pre printed pvc card and fargo pvc ultra cards from India. 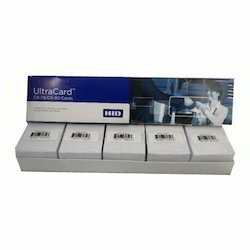 Backed by a team of adroit professionals, we are offering an extensive array of HID Fargo 81754 Ultra PVC Card. These are credit card size. 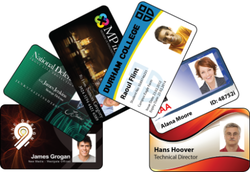 CR-80 30 mil cards are the standard size and thickness of most identification cards being used today. Fargo's 81754 UltraCards are designed and manufactured with the highest graphic quality materials to ensure clean, scratch-free cards for high-quality prints and extended print head life. These PVC cards are used in Fargo’s direct-to-card and retransfer card printers. Fargo 81754 UltraCards are perfect for ID cards, gift cards, business cards, membership cards and loyalty cards. The PVC cards are quality inspected and shrink wrapped in packages of 100, for protection and convenience. Fargo 81754 UltraCards must be handled with extra care. They can be easily contaminated by dirt, oils, and dust particles. Running contaminated PVC cards through your printer can ruin the print quality of the card and can cause damage to the internal print head. Keeping your cards stored in a safe environment and handling the cards by the edges can help reduce the possibility of these types of problems. We are providing a wide assortment of Adhesive PVC Card. We are offering Pre Printed PVC Card. Contact Smart Card – SCOSTA Card for Driving License, Vehicle Registration, etc. The PVC Cards are 30 mil. thick, to last a lifetime. These blank white CR-80 cards are designed to get the most out of your printer and cartridge, for crystal -clear badges and Id Cards that look great, even after years of use.